Ripon College recently joined the fight for the freedom to read in the 2012 Virtual Read-Out hosted by the American Library Association during Banned Books Week, September 30th to October 6th. 15 members of the Ripon College Community, students and staff participated in making a video for the Virtual Read-Out. Each read a section of a banned or challenged book found on the shelves of Lane Library. 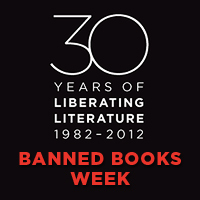 The video was submitted as part of a nationwide event to spread awareness about Banned Books Week and speak out against censorship. The issue that I wanted to capture with this event was that the books that are being banned or challenged are books that we love. While, to a certain extent, banning a book increases its popularity or infamousness, the act is a slap in the face to the fact that we should be able to decide what books we can read for ourselves. In the library the day of the event, there was an entire cart of banned books, and the best part was that I saw people struggling to choose just one book. Leading up to the event, I talked to many people who were almost as excited as I was that Ripon was hosting such an event. Several professors voiced their support, and told me how glad they were that this had come to Ripon. Many classes here read texts that have been banned at some point, somewhere in the world. Here in the U.S., most books are banned in K-12 schools because parents raise concerns about their content. But there are still some countries that have governmental bans on books. Some of the students I talked to about Hitler’s “Mein Kampf” being banned thought that maybe Germany is right to ban it. But who decides what criteria should be banned? And for whom should it be banned? As you’ll see in the video, Dr. Seuss’s “Green Eggs and Ham” was banned in China. Censorship is nothing more than trying to force your views on others, by restricting the information they have access to. I’m grateful that Ripon College has shown such strong support for the freedom to read, and that as a school, we support access to all knowledge. For more information, visit www.ala.org and view Advocacy, Legislation, and Issues.